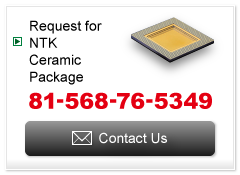 We offer a variety of highly reliable ceramic packages to meet our customer's requirements, from packages customized for particular applications to standard packages used in device evaluations. Standard packages used in device evaluations feature standard products that help reduce expenses for initial investment. For more on package forms and dimensions, please refer to the list of standard products below. We also accept inquiries regarding the following features of IC packages. Please contact us if you have questions. These ceramic packages for surface installations allow an airtight seal while offering reduced size and weight with a lower profile. Ceramics provide higher rigidity than conventional materials, yet also offer the greater strength that is required. We offer ceramic packages using multilayer ceramics with characteristics including high rigidity, lower profile and greater compactness, low warpage, and excellent dustproof performance. We also offer designs and standard products based on the customer's requirements. 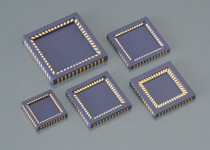 Suitable for industrial and CMOS/CCD packages. These packages utilize the properties of high strength, high reliability, airtightness, and compactness to support vehicle safety, driving performance, and security. 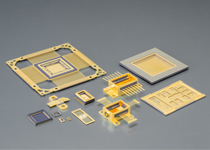 We also offer ceramic packages for acceleration and angular velocity sensors used in MEMS technologies. 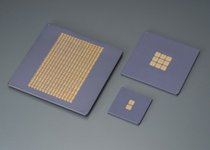 IC testing packages require increased size and greater precision in silicon wafer pad positioning to reduce the number of tests. 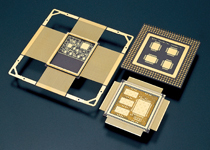 Our packages are compatible with large substrate firing technologies and high-density, high-precision wiring. Our vast store of manufacturing processes also allows us to shorten production times in support of the customers' custom design requirements. 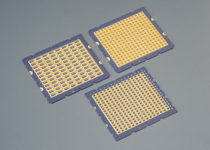 These test tool ceramic packages are used in running electrical tests with probes (needles) brought into contact with IC (wafer) terminals. 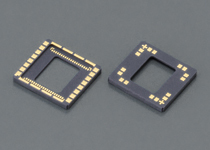 They are used as relay substrates to mechanically and electrically connect the probe and PCB in the probe card. 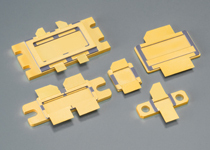 Thin film technologies are used to form high-precision terminals on alumina ceramic multilayer substrates of over 20 layers. 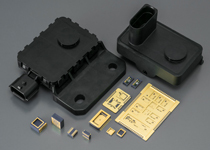 The ceramic multilayer wiring of these airtight, highly reliable packages enables greater flexibility in design. 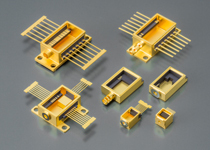 A variety of external lead terminals, case fittings, and heat sink materials is also available. Used in short-range and long-distance transmissions, these are packages in which metal case fittings, leads, and sleeves are attached to the multilayer ceramic field through silver brazing. 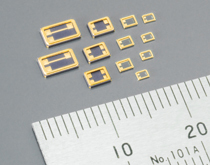 These RF packages for use in the high-frequency spectrum meet demands for high frequency and high output. Electrical and thermal characteristics are optimized through simulations during design. 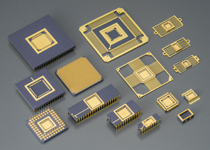 Please contact us to learn more about available combinations of heat sink materials and other parameters. 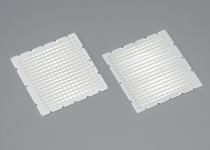 We also offer high-density multilayer wiring substrates, MCM substrates, medical products, LED packages, and other products to help meet various specialized requirements.